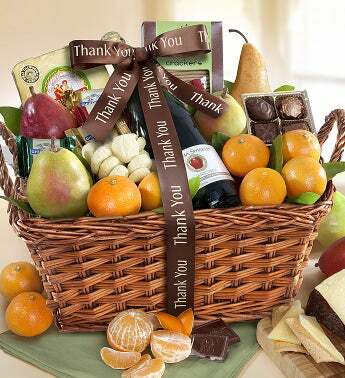 This gorgeous thank you gift basket that’s filled with fresh fruit is exactly what you’d expect from orchards that, like great friendships, are carefully tended. From some of the most beautiful, fertile lands along California’s Northern River Deltas, comes this elegant thank you gourmet gift basket that’s filled with Satsuma Mandarin Oranges, Romanello® Cheese, Urban Oven® Olive Oil Crackers, Filled Chocolates and much more. They’ll adore it – and you! This gorgeous thank you gift basket that's filled with fresh fruit is exactly what you'd expect from orchards that, like great friendships, are carefully tended. From some of the most beautiful, fertile lands along California's Northern River Deltas, comes this elegant gourmet thank you gift basket that's filled with Satsuma Mandarin Oranges, Romanello® Cheese, Urban Oven® Olive Oil Crackers, Filled Chocolates and much more. They'll adore it – and you!